If you hover over the shade of the item, you can find the ones that are 75% off. Also, you can just look at all the items and look for suspicious ones priced for $0.25 or "$0.75-$5.00." Unfortunately I only found these 3. Update me if you find others! I think I'm getting ready to splurge on another haul. I am on a shopping frenzy! Note: As of 10:35 PST it seems that ELF has removed these items. 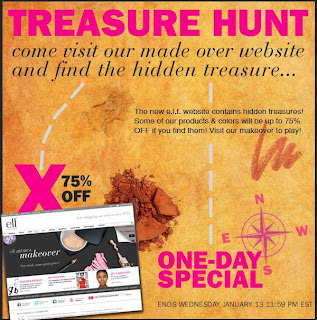 Keep on the lookout for shifting 75% off products!